We had a leisure breakfast and prepared for our outing to the Great Wall. We had a choice of going to Badaling which is the most popular ad also visiting the Ming Tombs (seen enough tombs) and visiting section of the wall, or to Mutianyu. This section of the wall, although a little farther from Beijing is the more recently constructed and had fewer tourists. We left at nine and got there about 10:30. We bought our tickets for a cable car and dodged aggressive vendors to the cable car. The Great Wall runs at the top of the mountain ridges and is an amazing sight viewed from the valley or from the wall itself. It seems to go on and on. There s not much to describe, the pictures have to do the job. I went farther up a very steep section of the wall to the end of the reconstructed portion. We were on the wall for almost two hours. It was very exhausting but well worth it. The views across the valleys to the north were awesome. Each tower was a little different. The wall and the towers had defensive ports all around for shooting arrows. Each tower is no farther that the distance to shoot an arrow from each tower, thus ensuring defensive coverage along the whole wall. After descending back to the valley, we were bombarded with sales appeals, 'One dollar' for a t-shirt, or whatever. Some of them were very aggressive and even got upset and yelled at us because we wouldn't pay attention or stop and look. We stopped farther down the valley and had a very nice lunch (dinner to us) of fresh trout. We saw the trout swimming in the pools outside the restaurant. After Lunch we ran across the street to a jade and Cloisonné factory store. There was every shade of jade from brown, dark green to white. They had a carving of an old Chinese ship carved out of one piece of Jade. The boat was about 15-20 feet long. If I remember right the listed price was 39,000,000 Yuan. About $5.5 Million. (Maybe I could bargain them down). We also browsed the Cloisonné half of the building and saw a lot we like. Carol got a couple of hand exercise balls, a vase and a couple of other small items. Again we did some negotiating. Not as radical at the other markets, but walking away most often does the trick. They said they would sell it cheaper to us because we were related to our escorts. We both fell asleep on the way back, we were physically exhausted. One last comment on Beijing: It is an ultra modern city. If you didn't have Chinese signs you would not be able tell it apart from any other major city in the world. The traffic is some of the heaviest I have seen anywhere. High rise office buildings and apartments are everywhere. A stark contrast to some of the Chinese villages we saw in western China. Even after you dispense with the myths that it is a single continuous structure and that it can be seen from space (it can't, any more than a fishing line can be seen from the other side of a river), China's best-known attraction is still mind-boggling. The world's largest historical site is referred to in Mandarin as Wanli Changcheng ("10,000-Li Long Wall" or simply "Very Long Wall"). 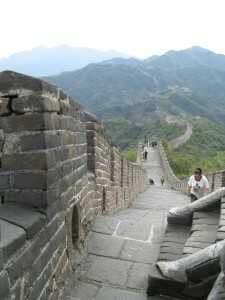 The Great Wall begins at Shanhai Guan on the Bo Hai Sea and snakes west to a fort at Jiayu Guan in the Gobi Desert. Its origins date back to the Warring States Period (453-221 B.C. ), when rival kingdoms began building defensive walls to thwart each other's armies. The king of Qin, who eventually conquered the other states to become the first emperor of a unified China, engaged in large-scale wall building toward the end of his reign, although tales of 300,000 conscripted laborers are embellishments of subsequent dynasties. During the Han dynasty (206 B.C.-A.D. 220), the Wall was extended west, and additions were made in completely different locations, according to the military needs of the day. Although many tour guides will try to persuade you otherwise, the Ming Wall you see today is unrelated to the Qin Wall, which lays far to the north. The Ming even went to the trouble of calling their wall Bian Qiang (Frontier Wall) to avoid comparisons with the tyrannical first emperor of China, Qin Shi Huangdi. The original Wall was built almost entirely from tamped earth, and often crumbled away within decades of being constructed. Talk of satellite mapping the current Wall is fanciful -- for most of its length, the structure is barely visible from the ground. This, and the fact that there is no single "Great Wall," makes it impossible to pin down the Wall's precise length. Those with an interest in exaggerating Chinese xenophobia portray Wall building as an essential part of the national psyche, but after the Han, few dynasties bothered with Wall construction, and relied mostly on trade, diplomacy, and the odd punitive expedition to keep the peace. Even during the inward-looking Ming dynasty, the Wall was viewed by many at court as an ancient version of the Star Wars missile-defense idea -- ineffective, absurdly expensive, and successful only in antagonizing China's neighbors. With the Ming wracked by internal rebellion, the Qing armies simply bribed the demoralized sentries. The Qing left the Wall as a monument to folly, and while early Western visitors were awed, it became a source of national pride only recently. Sun Yat-sen was among the first to view it as a symbol of national strength, an idea the Communists adopted, including it in the National Anthem. The Wall's most easily visited sections are Ba Da Ling and Juyong Guan, while Mutianyu, Jin Shan Ling, and the vertiginous Simatai require a full day's outing. Appealing options for overnight stays are The Red Capital Ranch at Mutianyu and the more basic Simatai YHA. The Great Wall at Ba Da Ling proved so popular that authorities restored a second section of the Wall to the east in 1986. Mutianyu is slightly less crowded than Ba Da Ling, but it does have its own traffic jams in summer. Located in a heavily forested area, it's especially photogenic in rainy, misty weather. You can hop over a fence to see more tempting, unrestored sections, but those planning to survey the entire length of restored wall will find themselves with little energy remaining. As at Ba Da Ling, there is a cable car to help those who need it.